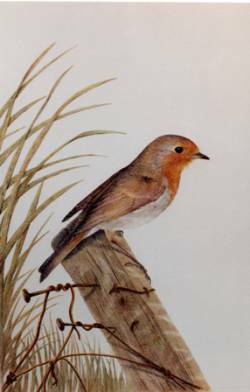 Robin by Nicholas Day Now you can own a signed limited edition print, (only 50 printed), by a successful Wildlife Artist using an original medium. At an affordable price! BEAUTIFUL. GREAT PIECE, FAST SERVICE:KAREN CLARK - U.S.A. Image is shown,in an acid free mount"European Robin On fence Post".Size of the print is 12" by 15"(38cm by 30.5cm)This is signed and numbered limited edition of 50 only.Printed to a very high resolution and standard, on superb quality paper with fast inks to guarantee total colour strength for at least 80 years under normal conditions.You will be very impressed with the price and the quality of this mounted print. Robin-(Erithacus rubecula)AKA: European robin The UK's favourite bird - with its bright red breast it is familar throughout the year and especially at Christmas! Males and females look identical, and young birds have no red breast and are spotted with golden brown. Robins sing nearly all year round and despite their cute appearance, they are aggressively territorial and are quick to drive away intruders. They will sing at night next to street lights. Where does it live? Breeding, Likes woodlands, parks and gardens with plenty of undergrowth. Wintering Similar to breeding habitats. Where to see it Across the UK in woodland, hedgerows, parks and gardens. What does it eat? Worms, seeds, fruits and insects. What does it sound like? The song is a sweet, high warbling; alarm call is a loud 'tic'. Did you know? Robins first appeared on Christmas cards as a representation of Victorian postmen, who wore red tunics and were known as ‘redbreasts’.